If you want to make a small gesture, then this is the arrangement for you to send. Whether it is a new baby, birthday, get well soon or just because you want to brighten someone's day, this is perfect! 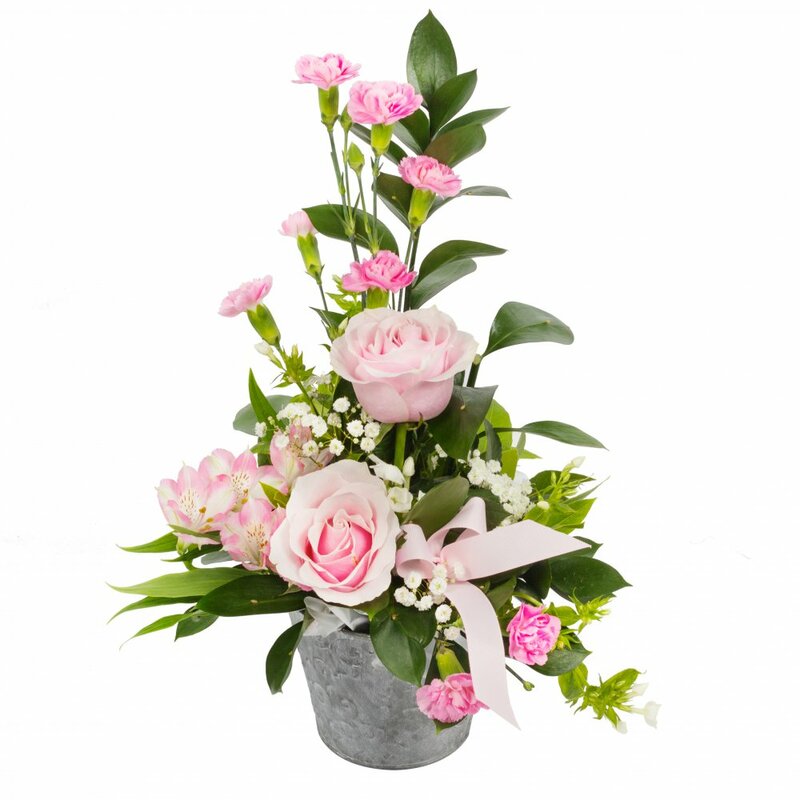 A small dainty arrangement of Roses, Spray Carnations, Alstromeria and foliage arranged in Biodegradable Oasis foam, which supplies the flowers with their water. The pot may be slightly different from the picture, but will still look amazing. Your card message will be handwritten on one our luxury folded cards together with care instructions to ensure the flowers are kept as fresh as possible. At Sarah Coxon Floral Design our flowers arrive daily from the dutch flower auctions and direct from the growers, so you can have every confidence you will be sending the best quality there is! This bouquet has an amazing selection of fresh flowers in pinks, cerise and lime green. With scented lilies, Roses, Gerberas, Carnations and Chrysanthemums it is no wonder why this arrangement of floral blooms is very popular! The flowers are tied together and presented in a water bubble, which is hidden in the thick bag. Wrapped in colour co-ordinated tissue paper and cellophane and your card message on one of our luxury folded cards, this is the complete package which will be admired by all! At Sarah Coxon Floral Design we receive our flowers from the dutch flower auctions and direct from growers, so you can be assured that you are buying the best quality flowers there is! Please note it may be necessary to substitute some varieties of the flowers due to seasonal availability. If we do this the overall design will still be as stunning as the picture.